Taking my dog somewhere to run around and enjoy the outside is a favorite way for us to spend time together. Having an off-leash reliable dog gives me the freedom to do this. When I’m in Staunton, Virginia I love to take the dogs to visit Gypsy Hill Park. Recently I visited there with a friend to take our dogs to Gypsy Hill’s dog park to let the dogs run and play on the fun agility equipment. But when we arrived and found the dog park packed with lots of other dogs, my friend didn’t understand why I opted to not bring my dog inside. (My friend and I had previously visited the park on a weekday later in the evening when the dog park was empty and we’d had a great time watching our dogs play and we’d used the agility equipment for some fun training practice). In fact, most of the dog owning population and many of my dog training clients are of the opinion that dog parks are the best thing since sliced bread. In recent years, dog parks have started popping up in more and more communities and while most dog owners welcome the addition, personally, I do not like them. In theory, a dog park a.k.a. a safe, fenced in area to let your friendly dog run off-leash and play with other friendly dogs sounds like a fantastic idea. The problem is that in reality, dog parks end up being very dangerous places for our dogs. Let me explain why I, and many other smart dog people, feel so strongly against using dog parks. Untrained Dogs: The population inside a dog park generally consists of dogs that are not off-leash trained and/or not trained well enough to listen when playing with other dogs. This is because a fenced dog park is the only place many owners feel “safe” letting their dogs run around off-leash. This creates a group of dogs that are not under control of anyone, except their own desire to run and play with the other dogs. Too Much Energy: I see a lot of dog owners using dog parks (and doggy daycare for that matter, but that’s another blog itself) because their busy schedules don’t allow them enough time to give their dogs the exercise they truly require, so to make amends they bring their dogs, with all their pent-up energy, to the dog park to “let off some steam” or “get their crazies out”. So now the group of uncontrolled dogs adds to the likelihood of negative outcomes with the fact that they are all in a very over-stimulated and over-excited state of mind. No Supervision: Dog parks that are frequented by the same dogs and owners end up becoming more of a social hour for the humans than the dogs. The owners go around and say hi to every dog, giving out treats or bringing in toys (another problematic occurrence at dog parks) for the dogs to share all the while paying more attention to their conversations with each other than what their dogs are doing. Some people are on cell phones, others are focused on their children, and all the while no one is really monitoring the interactions between the dogs. Not all dogs will enjoy a dog park (or daycare) environment. Realistically, only a small percentage of dogs do well in these situations. I see dogs that are clearly not enjoying the interactions with the other dogs and are very patiently communicating their discomfort of the situation with clear body language but none of the humans are really paying attention to this communication. Meaning the dogs get away with bullying shy or submissive dogs, turning your friendly dog into a fearful, overly defensive or reactive dog. Young, energetic dogs are allowed to harass older and mellower dogs to the point that the older dog feels the need to make their discomfort more obvious by growling, snapping or biting. Then, almost without fail, the dog who was minding his own business just trying to calmly mill about is being blamed for “attacking” the overly-friendly a.k.a. rude dog who “just wanted to play”. Dog parks are a perfect place for your dog to learn that he cannot count on you to advocate for his comfort and safety. He cannot trust that you will step up and protect him when he is feeling overwhelmed or threatened. Ultimately, dog parks are great for one thing: creating reactive dogs that use aggressive behavior to keep other dogs out of their space. What should you do instead of going to a dog park? 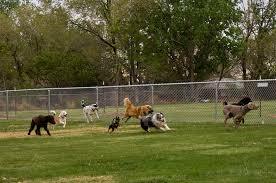 There are far better ways to socialize and exercise your dog than visiting a busy dog park. Pack walks with an experienced dog walker, doggy play dates with a friend of family member’s dog that your dog already knows and enjoys spending time with, taking your dog out to public places and letting your dog hang out and watch dogs pass by without having to directly interact with them or going on structured walks with you, the most important person in their life. Socialization does not mean your dog has to play with or even meet every dog you come across. Just like people aren’t expected to like and enjoy every person they meet, your dog isn’t going to like every single dog he meets and it’s our job as dog owners to understand and respect that.